Last November, the National Complete Streets Coalition adopted a new and improved policy framework for grading Complete Streets policies. Our revamped Elements of a Complete Streets Policy raises the bar by calling for stronger commitments to equity and implementation. To celebrate the new framework, we’re highlighting some of the best Complete Streets initiatives, projects, and champions around the country in lieu of our annual Best Complete Streets Policies report. Between now and the release of the full report on March 21, we will profile one winning initiative each week. Last week’s featured profile was Rochester, New York’s Inner Loop East Transformation Project. This week: Las Cruces, New Mexico’s innovative work with land use and transportation. View of Plaza de Las Cruces. Photo courtesy of Victor Gibbs. The City of Las Cruces, NM is one of many cities across the U.S. creating a more mixed-use, accessible, and walkable community. The key to their success? A Downtown Master Plan championed by local residents, business people, elected officials, and city staff that recognizes the strong connection between land use and transportation. Originally adopted back in 2004 and updated in 2013, and again in 2016, the Downtown Master Plan is a living document that reflects the community’s vision. This plan was crucial to the city’s adoption of a form-based code and advancement of Complete Streets initiatives, including a recent flagship project, Plaza de Las Cruces. Las Cruces has implemented four of the key implementation steps for Complete Streets initiatives. In the late 20th century, a period marked by nationwide urban redevelopment, the City of Las Cruces made planning decisions that resulted in expansive parking lots, low density development, and high-speed, one way streets. Many community members refer to this as one of the worst mistakes in Las Cruces’ history because it wiped out the city center. Motivated to bring “heart” back to the downtown area, the community worked hard to create a more walkable and accessible community by implementing their Complete Streets policy and Downtown Master Plan. Las Cruces’ Complete Streets policy, adopted in 2009, calls for considering Complete Streets when “developing, modifying, and updating city plans, manuals, rules, and regulations and programs.” This stipulation helped the city drive implementation and inform their Downtown Master Plan, which reflects Complete Streets principles and embodies the importance of meaningfully integrating land use and transportation. The Las Cruces Downtown Master plan has undergone several updates over the years to keep it current and ensure it reflects the desires of the community. The most recent update in 2016 involved five consecutive days of community discussions followed by several open houses over the next few months to refine the recommendations. This plan is impactful due to its focus on creating safe and convenient streets that serve people and not just cars. Specifically, the plan calls for road diets, converting one-way streets into two-way streets (a switch that slows car traffic and encourages more foot traffic), adding wider sidewalks, bike amenities, and a public plaza. These are all considerations that will make it safer and easier for residents of Las Cruces to get to the places they want to go, whether by foot, bike, transit, or car. Las Cruces regulating plan. Courtesy of City of Las Cruces, New Mexico, and PlaceMakers, LLC. Instead of continuing to rely on their conventional zoning codes and regulations, Las Cruces’ Downtown Master Plan laid the foundation for the city to adopt a form-based code in 2016. A form-based code, an alternative to a conventional zoning code, is one tool that cities can use to support mixed-use development and encourage more walkable, diverse communities. Rather than focusing on what happens inside of buildings, form-based codes focus on the physical form of buildings (like height, window coverage, how close buildings are to sidewalks, etc.) to create a streetscape that matches the community’s vision. One of the impacts of the Las Cruces code is that it no longer mandates the creation of new parking spaces for new businesses, effectively eliminating parking minimums. 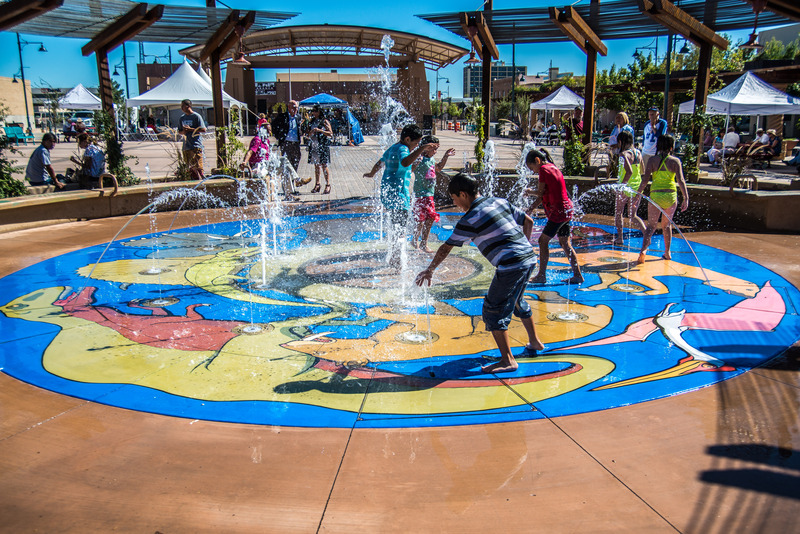 The city implemented a major part of the Downtown Master Plan’s vision in 2016 with the opening of Plaza de Las Cruces, a public gathering space located in the center of the town. In addition to creating a community plaza, the project also narrowed the travel lanes and widened the sidewalks along surrounding streets which has strengthened access to the plaza and the transportation network as a whole. 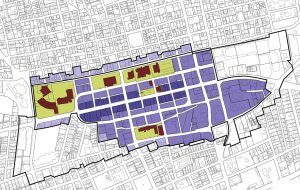 To further ensure the plaza is accessible, the new form-based code will require development around the plaza to be a dense mix of housing and retail spaces. The plaza project is creating space that people want to go to and making sure that people can actually get there. Opening day at Plaza de Las Cruces. Photo courtesy of Victor Gibbs. The story of Las Cruces is a great example of Complete Streets implementation. Instead of simply adopting a strong Downtown Master Plan and letting it sit on a shelf, the city engaged the community to regularly update the plan and ensure it reflected the vision of the community. Since then, the content of the plan has allowed the city to adopt a better zoning code, and build projects that people want to use and can easily access.